I have this theory that those who don't care for croissants just haven't experienced the the real thing: the flaky outer crust shattering as you sink your teeth in, releasing a buttery aroma and uncovering a heavenly tender, fluffy, rich interior. At the end of the experience you might have to get up and shake yourself off. Many croissants start out this way but after about a day they turn into croisoggies as they quickly stale and don't have quite the same effect on the palate. A croissant is a variation of laminated dough that starts out as dough wrapped around a buttery core. Samurai swords are made in a much similar way with molten metal being wrapped around a red hot iron core. Coincidence? I think not! 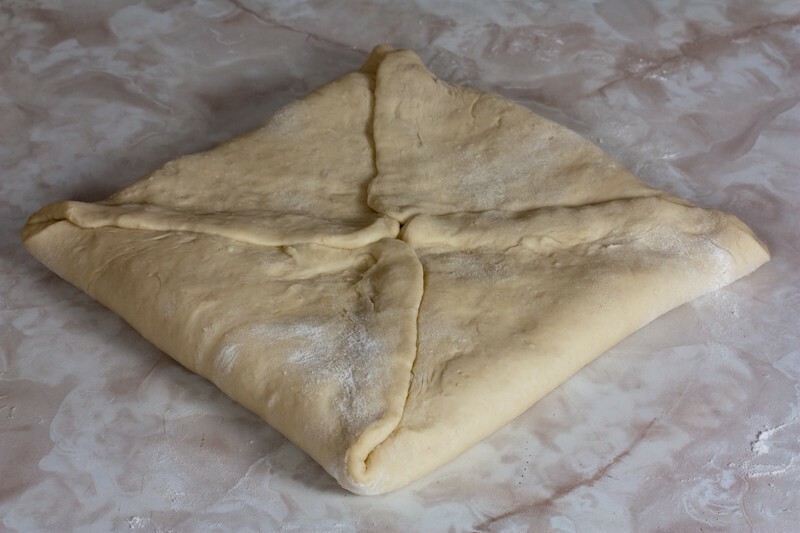 This dough is folded and wrapped around itself to the point of where there are several dozen layers of fat and dough. When baked, steam is released and trapped between the layers which provides a leavening lift as well as flaky goodness. This Vegan Croissant recipe features a mix of Vegan Butter and shortening to mimic the similar fat content of butter. Do not use tub margarine for croissants if you don't want to waste your time. 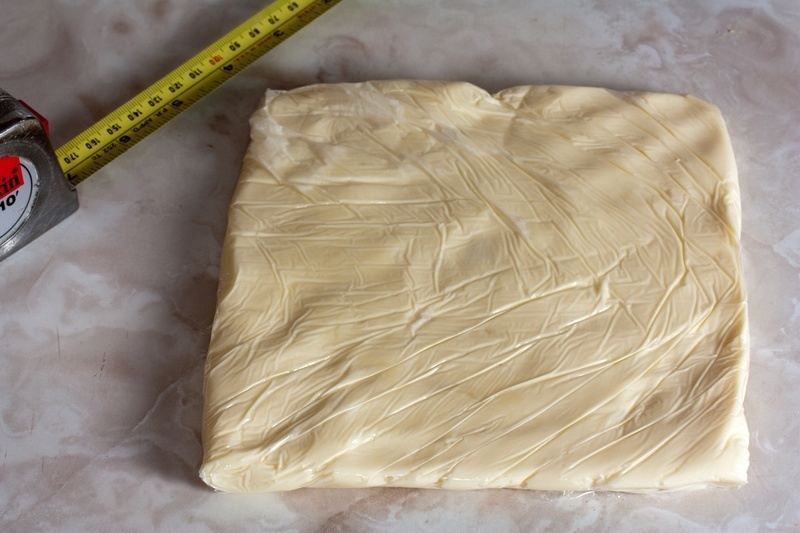 It's all about having a high-fat Vegan Butter so there's more distinction between the fat and dough layers. Making croissants is much easier than it looks but does take about six hours in the kitchen due to having to work with the dough at specific intervals. I recommend tackling these when you're going to be around the house anyway doing chores, wash, cleaning your guns, etc. That way you can just duck into the kitchen from time to time to get to the next step. You'll be rewarded with some of the finest vegan croissants this side of the Atlantic. In a small mixing bowl, whisk together the yeast and warm non-dairy milk. Allow it to sit for about 10 minutes so the yeast activates. 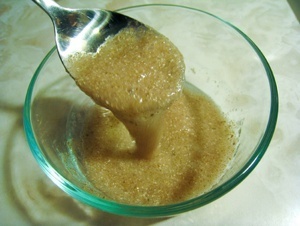 In a medium mixing bowl, whisk together the bread flour and 1 ¼ cups of the all-purpose flour, sugar and salt. Add the non-dairy milk mixture to the bowl of an electric mixer fitted with a dough hook. Add the flour mixture and knead until the dough forms a sticky ball, about 5 minutes. Add the 2 Tablespoons of Vegan Butter, one Teaspoon at a time and mix the dough as you did above for another 5 minutes or until the dough forms a smooth sticky ball. If the dough is too wet and doesn't come away from the sides of the bowl, add the remaining ¼ cup of all-purpose flour in 1 Tablespoon increments until you get the desired texture. Add the non-dairy milk mixture to a medium mixing bowl. Add the flour mixture and knead on a lightly floured surface for about 5 minutes. Transfer the mixture back to the medium mixing bowl, add the Vegan Butter in ½ Tablespoon pieces and use a mixing spoon to stir the dough in a circular motion. Switch stirring directions a couple times to thoroughly develop the gluten until the mixture forms a sticky ball, about 5 more minutes. If the dough is too wet and doesn't come away from the sides of the bowl, add the remaining ¼ cup of all-purpose flour in 1 Tablespoon increments until you get the desired texture. Roll the dough into a ball and use a sharp knife to cut an X shape into the top, extending halfway through the dough. Place the dough in a medium mixing bowl, cover with plastic wrap or place a plate on top and refrigerate for at least two hours. In a medium mixing bowl add the 2 ½ sticks of Vegan Butter pieces, the half stick of shortening pieces, 2 Tablespoons all-purpose flour, lemon juice and mix on low until just combined. Place the mixture on a sheet of plastic wrap and use a bench scraper to shape to a rough 7 inch square. Wrap the Vegan Butter square in the plastic wrap and shape it to a more accurate square. Refrigerate for at least one hour. 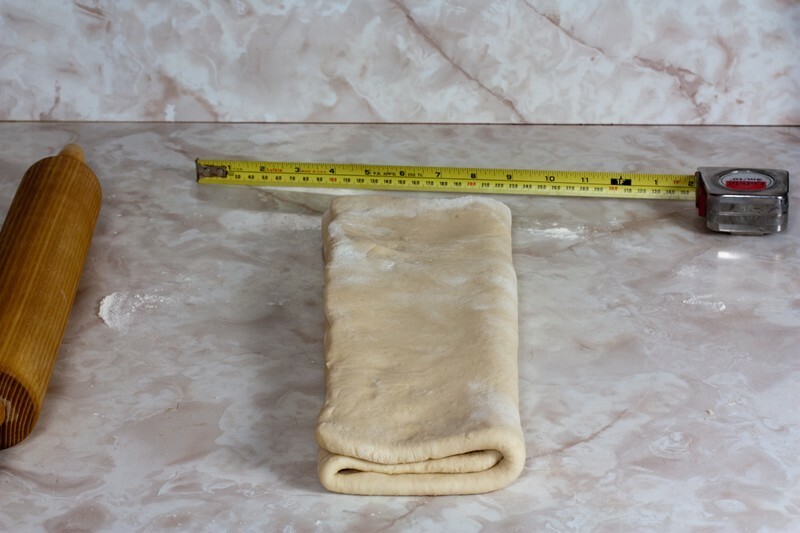 Place the dough on a lightly floured surface, coat your rolling pin with four and roll out along the X to 11 inches square. Roll three times in each direction using long even strokes, dusting your rolling pin with flour as necessary. Remove the Vegan Butter from the plastic wrap and place it diagonally on top of the dough. Fold the corners of the dough over the Vegan Butter as if you're wrapping it like a gift. Pinch the dough ends together to seal. 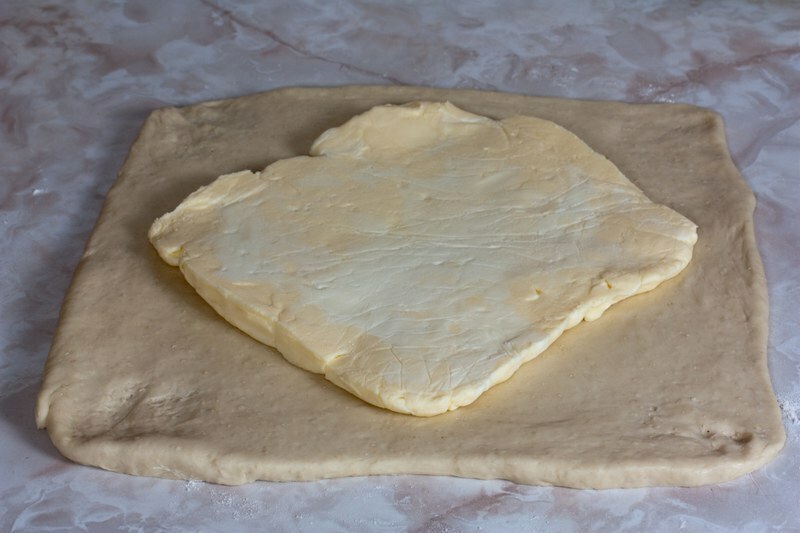 Use a rolling pin to lightly tap the dough, starting from the center and working your way towards the edges until the square becomes bigger. This helps make the fat pliable so it can be rolled with the dough. 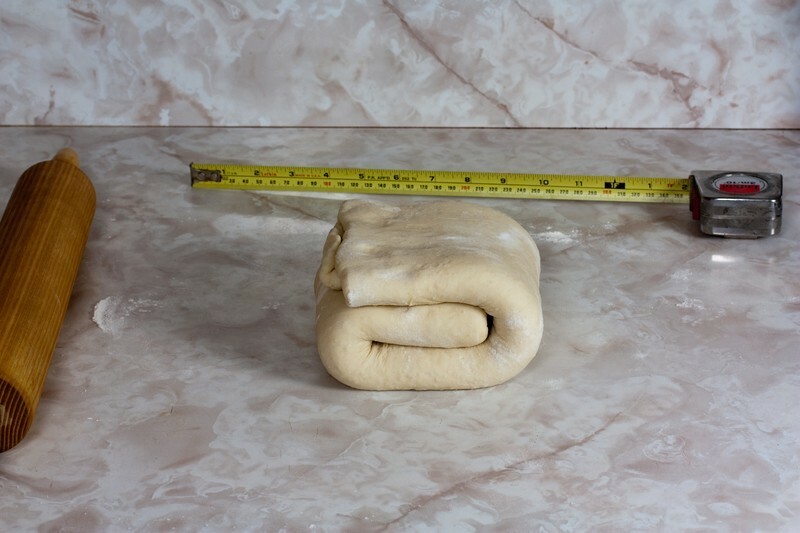 Carefully roll the dough out to 14 inches square. Feel free to dust the dough with flour if it begins to stick to anything. Fold the dough in three folds like a tri-fold business letter. This is known as a turn in the laminated dough world. 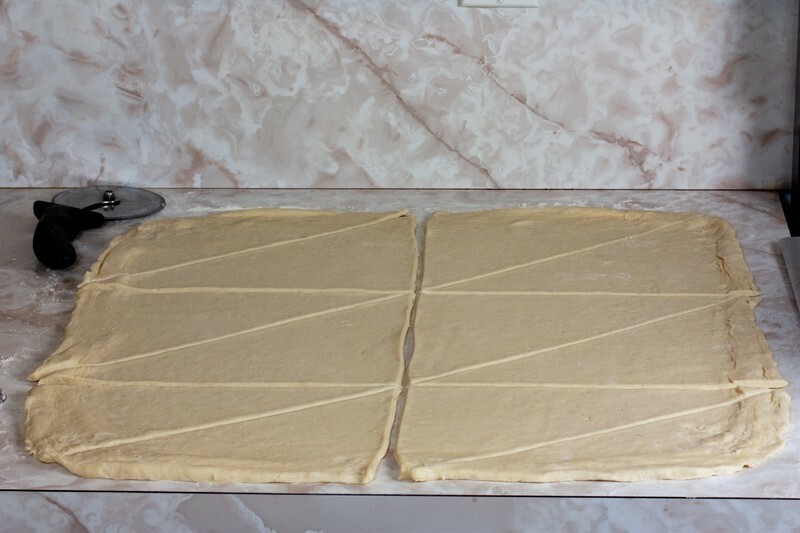 Now turn the dough 180 degrees and fold it in three folds again so it turns into a square. This counts as another turn. Wrap the dough in plastic wrap and refrigerate it from one hour to three days. The refrigeration allows the fats to resolidify and the gluten in the dough to relax. This causes the dough to become more pliable and elastic while maintaining its strength. Now is a great time to take a break for a day or so if you need to. It's important to not let the dough sit in the refrigerator for more than 3 days because it can start to discolor. Repeat Step 6 again so you have a total of four turns. This will give you a total of 243 layers of fat and dough. Wrap the dough in plastic wrap and place it in the refrigerator for one hour again as you did in Step 6. Line two baking sheets with parchment paper. Roll out onto a liberally floured surface to a 20 inch square. Using a pizza cutter, cut the dough into 2 rectangles then cut each rectangle into thirds so you have 6 small rectangles. Cut each small rectangle diagonally to make 12 triangles. 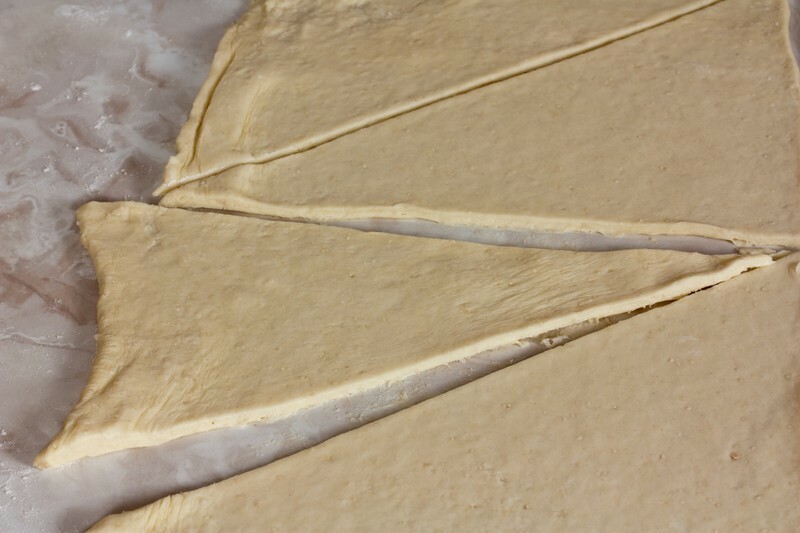 Pick one of the dough triangles up with one hand holding the short side and the other hand holding the sharp tip. Carefully stretch the triangle so it's about one inch longer than it was originally so the sides are symmetrical. Flip the triangle upside-down when placing it back on the countertop. Do this with the remaining triangles. 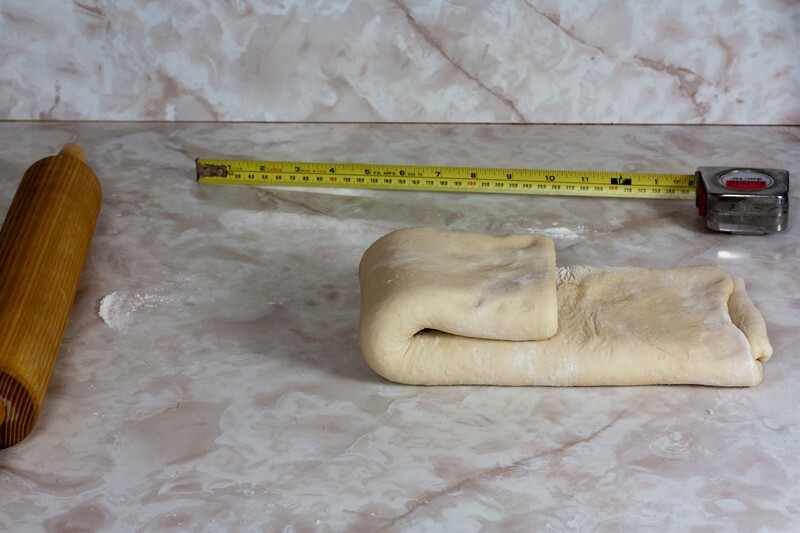 Note: the side of the dough facing up will be smoother than the side that's facing down and will have a lesser tendency to stick to your countertop while forming. This will result in croissants that look as perfect as possible. 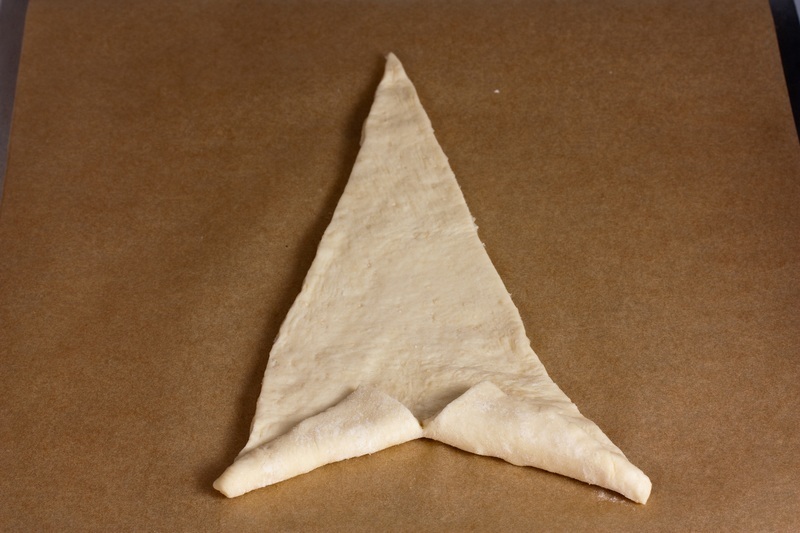 Cut a 1 inch slit into the middle of the short side of a dough triangle. 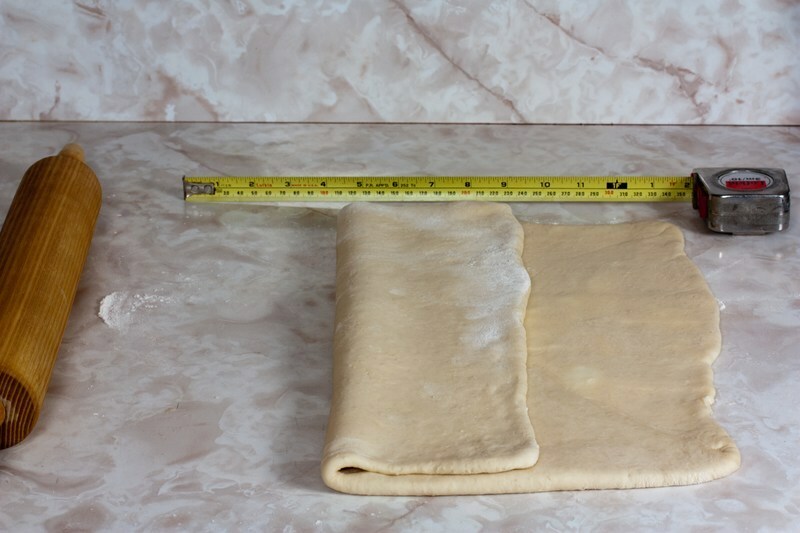 Fold the dough away from the slit outwards. This makes it easier to form the croissant into a crescent shape. Do this with the remaining triangles. Roll the triangle from the short side along its length using both hands pushing away from you. 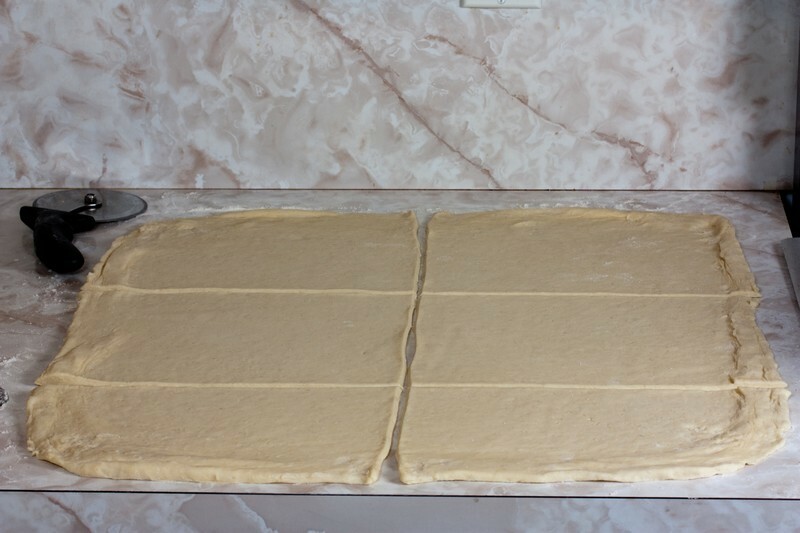 Leave ¼ of dough tip unrolled. Transfer the croissant to the baking sheet making sure the unrolled tip is facing downward, pointing to the baking sheet. Shape the ends of the croissant inward to form a crescent shape. Do this with the remaining triangles. Preheat your oven to 400F (204C). Loosely cover the croissants with plastic wrap and allow them to rise until barely puffy which should take about 60 minutes. They are not intended to double in size. 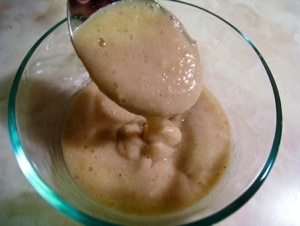 In a small mixing bowl whisk together the soy milk and agave syrup until smooth. This dough wash will give your croissants a golden, crispy exterior. Brush the croissants and bake until they're golden brown, about 20 minutes. Rotate the baking sheets on the racks and front to back halfway through the baking duration. Cool the croissants on a wire rack and serve warm. Croissants can be stored at room temperature for 2 days or 2 weeks in the freezer if thoroughly wrapped in plastic. This recipe makes about 12 Vegan Croissants. Extraordinary! Time consuming but so worth it!! I've made these several times. It took me a while to get a hang of rolling out the turns and cutting them so the croissants came out symmetrically, but now that I've done it a few times I've gotten better. My biggest mistake the first time was not giving myself enough counter space to work on, which made made managing the dough so much more difficult. These are time consuming, but AMAZING! 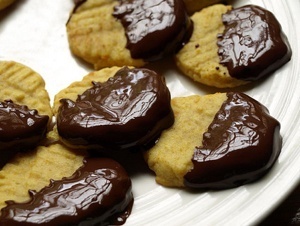 I only make them on special occasions, but my family goes bananas for them. Even the pickiest eaters among us savor these. I double the recipe and still they are gone by the end of the weekend. They are flaky, buttery clouds of heaven that melt in your mouth. 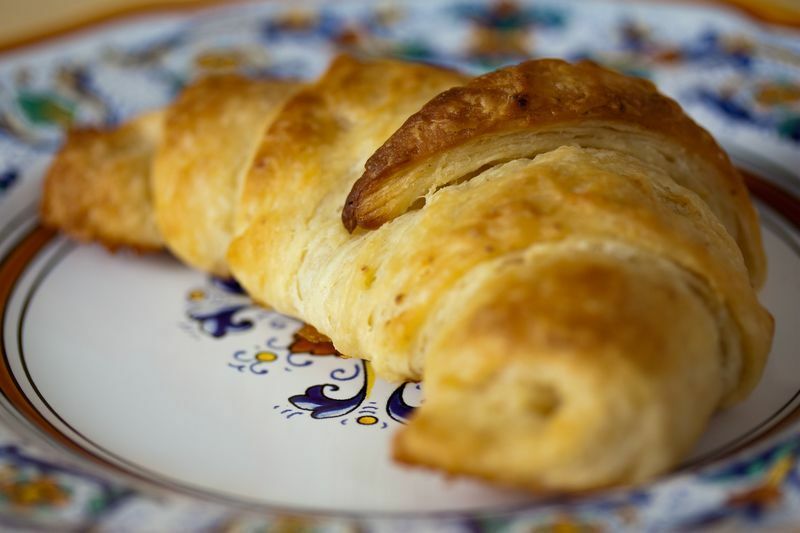 I've been craving flaky, buttery croissants ever since they were nixed from my diet - and this recipe totally satiated that desire! Flaky and delicately crispy on the outside, airy and a little chewy on the inside - it was bliss. The whole dozen was gone in 24 hours. I'd never made a laminated dough before, but your instructions were perfect and fairly easy to follow. I used shortening and butter from Earth Balance, and it worked well. I failed to notice the butter was salted however, so they were a little too salty - next time I'll reduce or just eliminate the added salt. 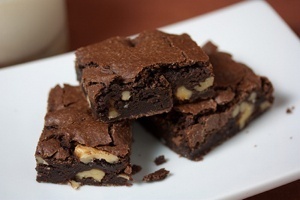 Thank you so much for this comprehensive and super successful recipe! I loved reading it and making it! Great, but I always need more flour! 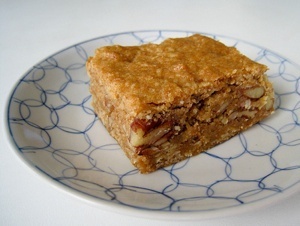 I've made this recipe a couple of times, and it's delicious! They are loved by all. However...I always need *lots* more flour than is called for. Do you have a weight measurement for the flour? Perhaps our measuring techniques are different. I'm open to other suggestions as well. I would love to make my own, but could this recipe be modified at all to be yeast free? Do you think I could use apple cider vinegar? I am not particularly good at baking anything. Just a questiom about folding. Do I have to wait an hour in the fridge for every turn I make? Or after the first one I can do 3 in a row? Hi Frederik! You want to allow the dough to rest in the refrigerator after every turn. This is because the gluten will need to have time to relax at a cold temperature every time the dough is handled. This will allow your croissant dough to be rolled with maximum pliability and minimal tearing. Happy turning! Hiya, I loved this recipe and the vegan coconut butter too... I plan on making it again but I would plead with to use put the whole thing in grams (or ounces if you insist) since weighing is more accurate and saves on dishes. I also wonder if you've ever put a bit of nutritional yeast in the butter to give it some more flavour/colour? Thanks again for the work you put into these recipes, they are amazing. Oh man, these were so good!!! And not that hard! I made the butter a few weeks ago and froze it, made the dough and butter square last night, put them in the fridge after step six, got up a bit early this morning, and we had fresh croissants for 10 o'clock. Thanks so much for all your hard work developing these Mattie, these were way more awesome than any vegan croissants I've had in a bakery so far! Have you had a chance to try this recipe with your Vegan European Cultured Butter in place of the regular vegan butter and shortening? Soooo happy with these! Was nervous throughout the process as the "butter" was showing through the dough and the dough was growing like mad in the fridge, but they were a complete success. Thank you for such clear and detailed instructions on something I haven't eaten in almost a decade! I made these for my husband's birthday, and they turned out beautifully. Thank you for the great recipe! I've made them once before using another recipe. They were possibly the worst things I've ever made, so I've been scared ever since to have another go. Until now. First of all I'd tried the product of this recipe thanks to another person, she sent me the recipe and voilá! I can make croissants! It's an arduous process but oh so satisfying! I had four croissants for breakfast so my body sort of hates me now and my farts smell quite bad, but the croissants are a perfect texture and flavour, it's just amazing. My housemates didn't even mind being woken up for them. Good times. So happy the croissants worked out so well for you Mary! I had seen that after i had posted. Sorry! I have everything in fridge now after step 4. Step 7 should be repeat step 6 though, not step 5. After four turns, do i put the dough back in the fridge again for at least an hour before proceeding to step 8? Hi Howard, you're right that it should be Step 6. The dough does, in fact, go back into the refrigerator before proceeding to Step 8 as you mentioned. I'll update the recipe to make that more clear. Thanks! I call for 1 1/2 cups flour in the recipe and 1 1/4 cups flour in the recipe steps to account for the different absorption rates of flour. In Step 2 I specify "If the dough is too wet and doesn't come away from the sides of the bowl, add the remaining ¼ cup of all-purpose flour in 1 Tablespoon increments until you get the desired texture." This is to prevent the croissant dough from turning out too dry if your flour absorbs too much water. If the dough is too dry, it's next to impossible to make it more moist later. Good luck! Thank you Mattie this recipe helped my pastry cookery many fold. I have done croissant pastries only a few times and the texture has always been far less flaky than usual, and they were more like broche texture than croissant. I feed a sourdough culture - in short - I didn't use your ingredients because I was doubtful if vegan butter was 'soya margarine' or 'copha.' Well I should have known to use copha, and next time I will use it, but this time I used butter. I couldn't find shortening in the supermarket either. I mixed 190ml soy milk, 28g butter, 370g white wheat flour, 150g wheat starter, tsp of salt, tbsp of brown sugar and barley malt. I didn't really knead the dough much, I rolled out the 230g butter, and the dough, and used the enveloping fold as shown in your recipe. 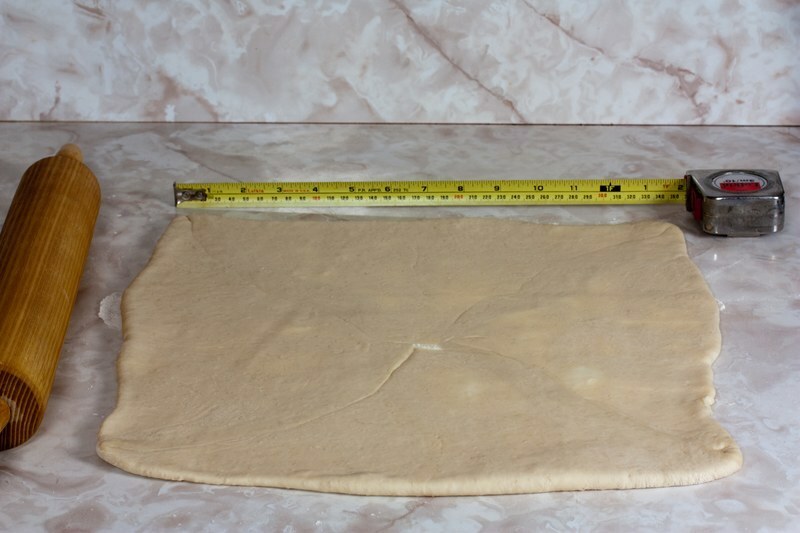 I rolled dough out into a big square and folded in thirds, twice, as shown, then refrigerated for about 12 hours, and then returned to the fridge overnight. ( previously, it wasn't really explained that the dough must rest for quite some time). Next day I turned it around 8am, then went to visit someone. I came home and made the fourth turn in the mid afternoon. But I thought it should probably go back in the fridge for one more hour before rolling out and ultimately shaping the triangles. I followed the step of cutting a slight wedge from the triangle before rolling them, and I found that it also made the pastries have less bulk in the middle, and small croissants bake better. They were absolutely delicious Mattie. Please check my profile for pictures of my pastries. Those croissants look awesome josho! I don't recommend using copha for 100% of the fats next time because you need to have a specific water-to-fat ratio so steam is produced that will intensify the flaky layers. Also, since butter is roughly 80% fat and copha is 100% fat, the excess fat in the copha would turn your croissants into soggy oil slicks (it's happened to me). So I recommend using copha in place of the shortening if you can't find it, and margarine instead of butter if you choose to make a vegan version. Oh and I clarified the recipe to state that the dough can be refrigerated "from one hour to three days" at the end of Step 6, instead of alluding to it needing a longer chill time. 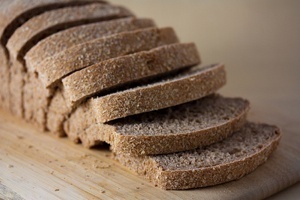 But this extended time may have helped you since you opted to knead less initially- the gluten probably had lots of time to figure out how to bind during its time in the refrigerator. Thanks for the great feedback and I'm thrilled how they turned out! I've been working on a gluten-free/dairy-free croissant recipe for a while and I was wondering: do you mix the buttery sticks with the shortening simply to make a firmer butter? 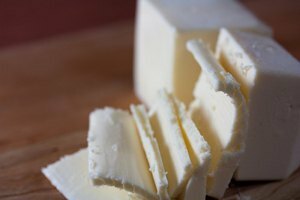 Would augmenting the coconut oil content/decreasing the canola oil content in the regular butter recipe provide the same effect? I'm just curious since I've read a lot of recipes in French (which is my mother tongue) and none of the classic standard croissant recipes call for shortening in addition to butter. This is a great question Eli! I've thought about that too. 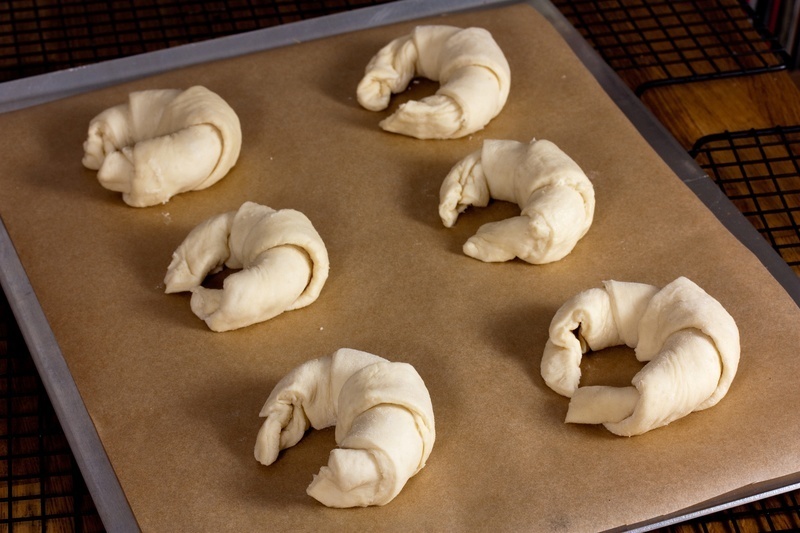 Shortening is not used in most of the baking in France, especially in croissants. The shortening is a trick to increase the fat content to increase flakiness. European croissant recipes don't need the shortening because they call for butter which Americans may know as European cultured butter. It has a few percentage points more fat which will make a great, flaky croissant on its own. I believe that real French croissants use an even higher fat butter for their croissants and other puff pastries that we can't get in the US market. Good luck and feel free to share any insightful vegan croissant experiments with me! 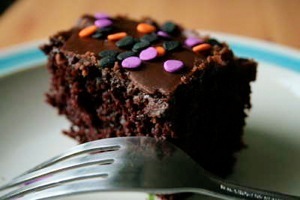 I stumbled across veganbaking.net a couple of days ago, and now it's my favourite site! Once I went vegan I thought I would never eat a croissant again, given they're basically 50% butter, but then I found this recipe. The vegan butter recipe is awesome, just make sure to make a double batch so you can make the croissants and have some left over for other stuff. Thanks and so glad you like the croissants a.cardilini! What I can use instead of vegan shortening? Thanks for your recipe!! I loved this recipe! I modified it slightly by doing the turns differently and encasing the butter one one side rather than in the center. 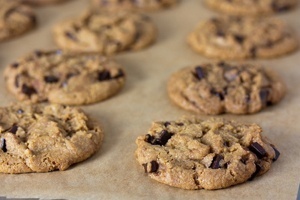 I have a read a lot of your articles and recipes on here and am quite impressed with your knowledge on vegan baking! I wondered why you added lemon juice to the recipe as I omitted it not quite understanding what role the acid played! Thanks again. Wish you were closer to Oakland so we could collaborate over one of your chocolate croissants. Are you currently in the restaurant industry? Thanks mybfskitchen! The lemon juice is just to increase the tart-factor of the croissant so it has a slight tang. I've seen people use Champagne vinegar and I'm dying to give that a shot. I'm actually moving to Oakland from NYC soon so we will be able to collaborate over a chocolate croissant! I'm not in the restaurant industry but I'm constantly screwing up in the kitchen as I try to learn things and try to decide on a future food startup some day. Thanks for the feedback! Would replacing the agave with maple syrup work? 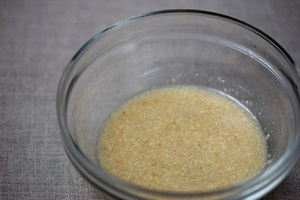 I have plenty of maple syrup, and I commonly replace it in cupcake recipes calling for agave. Great question Julia! I haven't used maple syrup instead of agave in my bread wash yet but I imagine it would probably work fine. Good luck! This was my first time trying croissants, and I must say that they were AMAZING. Everyone that tried them immediately wanted the recipe (which I gave to them) and wanted more. I was even solicited for my phone number- yes, they're that good. Thanks for such clear instructions and photographs. They helped with every step along the way. I will definitely be revisiting this recipe very soon! So glad these worked out for you Amanda! I never really know how easily a recipe like this is to follow until I hear back from people who bake it. Thanks so much for your feedback and I'm thrilled they were a hit! 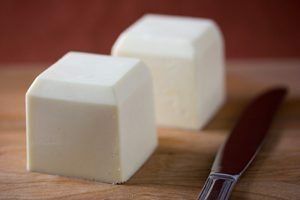 How much butter do you use for the butter square if you are making these using your Regular Vegan Butter? Hi jcanilly, Vegan Butter is interchangeable with regular stick margarine like Earth Balance or regular butter so the measurement should work with all three types. Good luck! I was wondering.. I am not Vegan! So can i use regular butter and regular milk instead of the vegan substitute mentioned by you in the recipe? And also all I have is All purpose flour! So can i use that in the place of the bread flour? If yes then is it the same measurement? And what can I use instead of Amber Agave syrup? Can i just brush on butter for the crispy layer? Or should i use Honey? Hi Rama! This recipe should work fine with regular butter and milk. 100% all-purpose won't give the dough the elasticity that it would have with the bread flour but it should work. It's going to absorb slightly less water so you might want to reduce the milk by 1 Tablespoon to compensate. Regarding the agave syrup, the traditional non-vegan version would involve an egg wash. you could probably get similar results by substituting honey for the agave syrup as you mentioned. Good luck! Hi, I made these yesterday for my boyfriend's birthday, so I wanted to let you know we loved them and thought they really tasted how we remembered :)! (and he was really impressed!). I didn't exactly follow the recipe because I'm a bit lazy and was on a time constraint.. I didnt wait for atleast an hour most of the times it asked me to. Only 1/2 an hour.. But the last time the recipe asks for the dough to go into the fridge I put it in overnight, and wow what a difference it made! All the other times the dough easily got little rips when i rolled it lead to a lot of frustration, the last time i rolled it, it was much easier :) next time i'll leave ample time and do it properly. I thought i'd ask you about something. My dough did not rise much, certainly not ask much as ypurs in the pictures. I suspect the yeast i used was a bit different to yours. It was called dry active yeast but they were these little round balls. You could see them in the dough quite easily, where as in your pictures you can't. Any tips for next time? These were terrific. Thanks so much for posting this! I made these for my husband today (who has missed croissants since becoming vegan), and we both LOVED them. Thanks for posting this! Everyone should try these. So glad these were worth the effort for you Sue! have you ever tried to freeze them prior to baking (ie, after make up and shaping)? 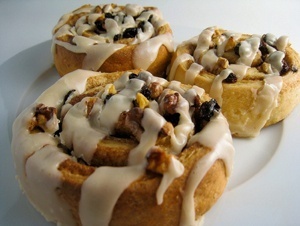 I think I would like to have a few of these lovely bites in the freezer for quick baking! I haven't tried freezing them after shaping but that's a great idea that should theoretically work! What margarine did you use for this? Hi Liz, I used Earth Balance Buttery Sticks. I've always wanted this recipe! Oh, my goodness! Ever since I went dairy-free & gluten-free, I've been sad about not being able to eat certain things anymore, and Croissants are one of those things. When I saw this recipe, I got very excited--but then I realised you were using regular flour. Do you think it would work with a gluten-free flour mix, meant for baking? I am dying to try this!! I'll bet this would work with a gluten-free bread flour such as the one made from Bob's Red Mill. If you give it a shot let me know how it goes! I have many more experiments to do with laminated doughs. I'll definitely post my discoveries.